Congratulations to us!! 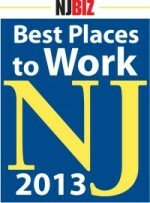 Trinity Rehab has been named by NJBIZ as one of the Best Places to Work in New Jersey for 2013!!! This survey and award program identifies, recognizes and honors the top places of employment in New Jersey that benefit the state’s economy, its workforce and businesses. Evaluation is a 2-part process: Part one consists of evaluating each nominated company’s workplace policies, practices, philosophy, systems and demographics; Part 2 consists of an employee survey to measure the employee experience. The combined scores determine the top companies and the final ranking. Trinity Rehab will be presented its award at a ceremony on Thursday, April 25.